Posted on January 24, 2019 at 2:40 pm. Swami Radha was a pioneer in providing in-depth personal and spiritual exploration of yoga. It was a time so different from now where “yoga” has become a mainstream word. From her own experience, she knew the power of these ancient teachings and understood their relevance for Westerners. The first participants were also pioneers, willing to commit to three months of personal study to expand their learning and to be able to offer the teachings to others. The essence of the course Swami Radha created 50 years ago remains, while the approach to teaching and the development of the various workshops has evolved. The course continues to be a magnet drawing together people wanting to deepen their understanding of themselves, their relationships and life purpose. The current YDC group used their own words to express what drew them to the course: healing, a time of transition, longing for a like-minded community, learning to expand beyond self-imposed limitations, desire for inspiration and joy, updating an old self image. 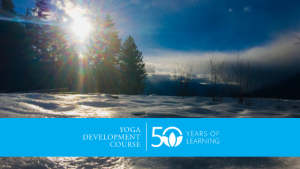 For the past 50 years, the YDC has been a journey filled with exploration, discovery and learning. We wish the same for this current group! Plan now for Jan 8 – April 8, 2020.